Shop stools come in several varieties. 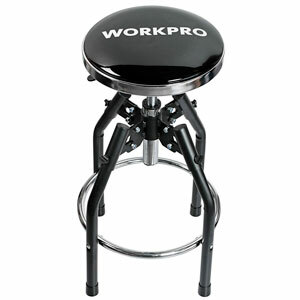 For some, the best shop stool is nothing more than a sturdy, simple stool or even folding chair. Others require something that’s more comfortable with plenty of padding or even a backrest. For garage environments, it’s important the seat has an adjustable height, made out of a material that cleans up easily, and is tough enough to prevent tearing or staining. Here’s what we recommend. This 360 degree swiveling stool is excellent for general tasks at the workbench or working on vehicles elevated by a car lift. The heavy duty construction will support up to 330 pounds and the stool has a padded seat measuring just under 14 inches in diameter. You can hydraulically adjust the height of the seat from 29 to 34 inches to get that perfect height for your workbench. 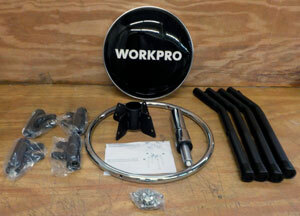 If you want a good, durable, no-frills shop stool, the WorkPro is hard to beat. Available in black and bright green but we expect 99% of buyers will choose the black. Owners of this stool tend to stress the warning that you should examine the instructions before assembling. These individuals were able to put the stool together quickly and easily without later having problems during use. Heavier individuals have also noted that the stool handles their weight well while providing a nice working height. There aren’t many complaints about this stool, and most tend to be related to assembly issues. In some cases, the seat won’t tighten completely, causing it to lower when sat upon. In others, the issue is more closely related to the size of washers or screws included, which might have been an error during the initial packaging and not a mistake during assembly. For those that want a bit of freedom to move around, the Seville Classics rolling shop stool fits the bill. With a seat height that adjusts from 24 to 28.25″ inches, think of it as a combination of a mechanics creeper seat and stationary shop stool. 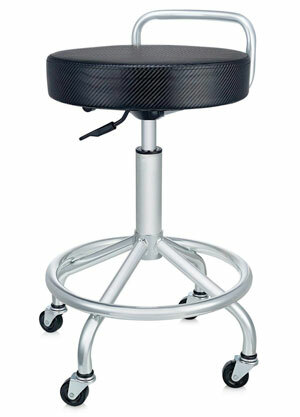 The 14 inch padded seat swivels a full 360 degrees and has a carbon-fiber style cover that looks great in any setting. Four 2-inch casters allow you to move to different stations or work areas and two of the casters can lock so you won’t accidentally move around when you don’t want to. Overall construction stacks up well against the competition and this stool is a good match with one of our favorite workbenches. The biggest negative is probably the seat. While it’s cushioned, some heavier individuals say the edges of the seat top are not soft enough and tend to hurt the backs of their legs. This is due to the seat surface being flat instead of having a slight dome shape. Also, the casters aren’t the best quality but they can be easily (and inexpensively) upgraded with a quick trip to the hardware store. With a look that feels equally at home in a shop or your home bar, this Craftsman hydraulic seat stool has an adjustable seat back and highly polished chrome finish. You can elevate the seat from 28.5 to 33 inches, and the feet can be adjusted to handle uneven surfaces. Between the slip-resistant feet and durable vinyl padding on the seat and backrest, this is one Craftsman quality stool that you’ll want to use for every job! Owners of this stool have reported using it for a wide range of tasks. In addition to normal tasks in the garage or shop, some use it for painting, cooking, and other crafts that normally require standing height. Others have noted that it can hold more than the listed 300 pounds with little issue. In most cases, owners report long-lasting durability and comfort. A few customers have had problems with the hydraulics on this chair. They report that the assembly may be wobbly or a leak might form after several months of use. The exact cause of these problems hasn’t been described, so they may be either due to manufacturing or assembly-based errors. 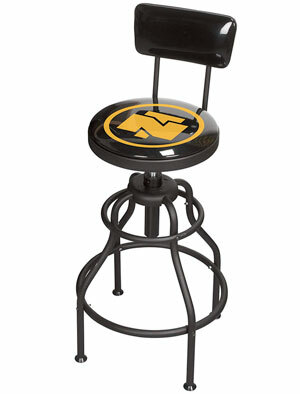 This shop stool by well-known Northern Tool has a durable padded vinyl seat and backrest with a matte powder-coated finish. Unlike many similar 360-degree swiveling stools, the backrest is both adjustable and removable for maximum comfort and functionality. You can adjust this comfortable 14-inch diameter seat from a height of 29 to 33 inches, providing excellent standing-height comfort. If there’s one piece of advice to turn this from a good product to a great one, it’s to throw away the instructions. Assembly is fairly straightforward, and the chair is very sturdy once completed. Owners note that the seat itself is very comfortable, and the height range works well with several big-name workbenches. Shipping quality has been the biggest complaint with this item. As with many other products ordered online, buyers have often received beat-up packaging, although the contents generally fare better. This is an all-too-common problem, and thankfully the damage rarely results in this stool missing washers or screws (a frequent complaint with other poorly-shipped products). If there’s one thing an artist will tell you, it’s that a good seat is just as important as good materials. 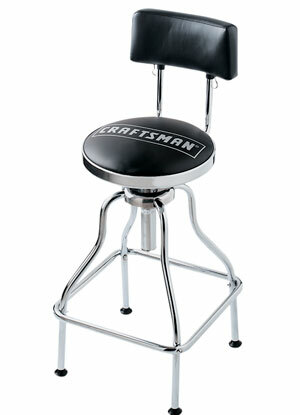 This drafting stool makes an excellent elevated companion for many shop and craft tasks. 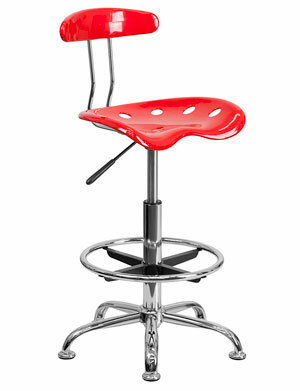 Built of a high-density polymer, the stool has a 22 to 30.5 inch seat height range and comfort-molded tractor seat. Adjusting the height is easy with a pneumatic lever found underneath the seat. The contoured seat creates an unexpected degree of comfort for first-time buyers. Unlike other work stools, there are over 15 different colors of this tractor seat stool available so not only will it work for the garage, you can use it in any room of the house. Quite a few owners of this product are actually repeat buyers. They’ve noted an improvement in quality, with numerous previous issues being addressed. Some even report a lifespan of up to a decade since there are no issues with fabric wearing out or tearing. There have been several issues with the backrest on this stool. Owners have noted that the rest isn’t actually affixed onto the connecting rods. Complaints about the backrest breaking off at a specific connection can be fixed by adding a single washer, which should have been addressed long ago.